Stella has just started taking swimming lessons, and you guys, this is totally major! We're on week two, and I don't know who's more excited about our swim Fridays, she or me. The grin on this kid as she swims "by mine selwf" is just too much. And my Mama heart: swollen and prideful beyond all recognition. Let's just say we're both pretty stoked. With an amazing pool right on our doorstep and an appreciation our year-round swimmable climate born from 24 years of Canadian winters, I feel like it's, like, kind of a crime not be at the pool every day of life. You know? 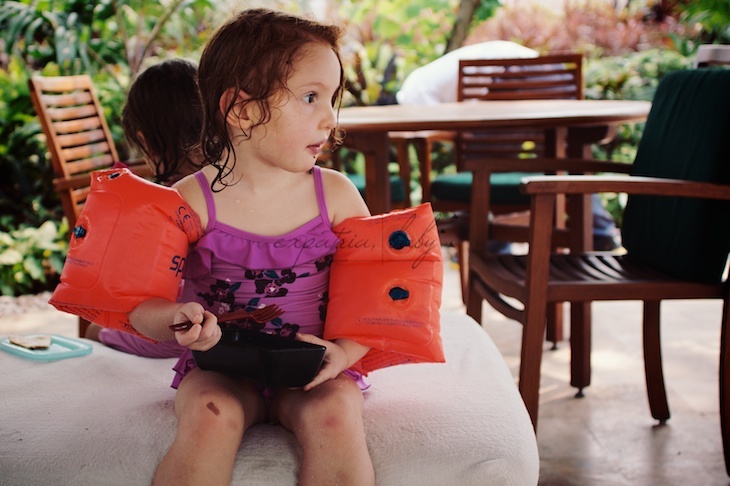 Plus, with a new baby coming in a few short months, well now's the time to learn to stay afloat in water so independent pool play is possible. Thus, swimming lessons. And now, this sounds terribly posh and privileged, and okay, it kind of is, but whatever. We're working with a private teacher who comes to our building to teach our three year old and her friend how to blow bubbles in the water. But, in the Jakarta context, believe me, it's totally the way to go. I mean, when you have Indo traffic to contend with, who wants to go to the municipal pool (oh, wait, there IS NO municipal pool, duh.) So swimming lessons in Jakarta happen at home. It's just the way things are done. On this particular Friday, we swam not once but TWICE! Swimming lessons were followed immediately by a swimming playdate. Because it's Friday, and why not? 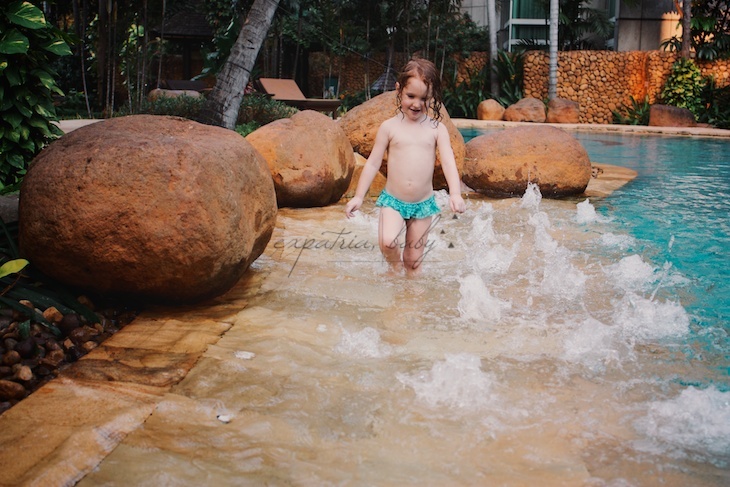 There was a little splashing, a little swimming, some time spent getting acquainted with a flutter board, a nasi goreng break, and then off to the next pool where the kids splashed, the mums chatted and there may or may not have been mango iced tea spiked with vodka. Fridays, I'm telling you. They're not too shabby. I love connecting with new people! I wanna hear your love stories, I wanna answer your questions, and I wanna know all about your family's wild road. Send me a note. Say hello. Ask me your questions. Ask me about life in KL, or Shanghai, or Jakarta. Tell me about your ideas for a shoot. BTW, I'm sometimes slow at email, well, and at texts. And What's App, if I'm being honest. I don't typically respond on weekends, as I'm either shooting or with my family. But I get to my messages. Eventually.